Brendon Hartley took to the skies over Melbourne in a fighter jet to put the new Scuderia Toro Rosso Casio EDIFICE Limited Edition watch range to the ultimate time test. For New Zealander Hartley, it was his first taste of the exhilaration of a high-powered aircraft. He set himself the task of taking off at Essendon airfield to the north of Melbourne and arriving over the Albert Park circuit, scene of the recent Australian Grand Prix, to a target time set by his Casio EDIFICE watch. "Time is everything in Formula OneTM - as it is in a jet fighter - which can reach speeds of 750kmh. I enjoyed the experience a lot, and this is something I will remember for sure, but I much prefer the high speed I get while driving my F1 car on track! Having synchronized our watches, we arrived over Albert Park right on time." The new range, the fourth series of partnership models with Scuderia Toro Rosso, combine dynamic design with advanced technology in line with the EDIFICE brand concept of Speed and Intelligence. The EQB-900TR-2A links to a dedicated smartphone App using Bluetooth®. The watch keeps accurate time anywhere in the world by automatically connecting four times per day to a time server through a paired smartphone. The EFS-S520TR-1A is a solar-powered watch that features a carbon fibre dial. It has a solar panel and a face made from scratch-resistant sapphire glass while the EFR-559TR-2A and EFR-559TRP-2A have inset dials at the 2 and 10 o'clock positions that convey a strong motor sports feel. 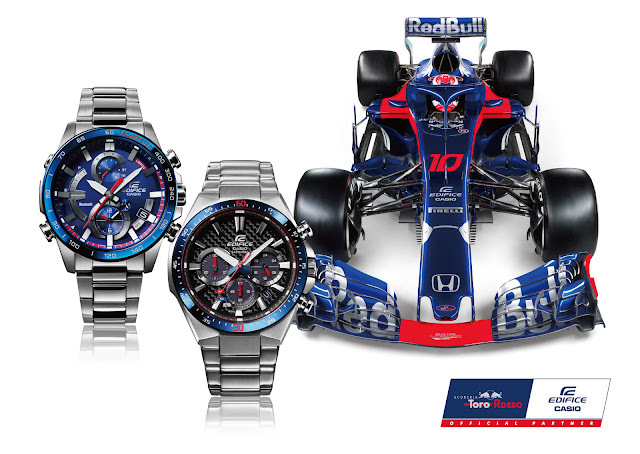 Scuderia Toro Rosso Team Principal, Franz Tost said: "We are delighted to continue our strong collaboration with Casio on the latest Casio EDIFICE Limited Edition range. The very latest models feature the striking red, blue and silver colours which takes inspiration from the stunning livery of our 2018 race car - the STR13. "As we compete in a demanding environment where every split second counts, Casio is a perfect fit for Scuderia Toro Rosso in terms of their brand values - Speed and Intelligence - and their quest for technical excellence. The latest Limited Edition range is a true representation of these traits."